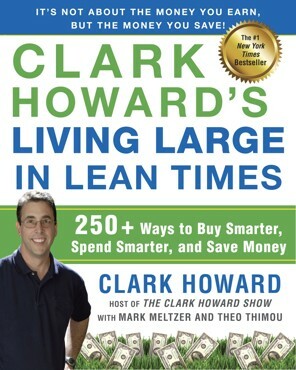 "Living Large in Lean Times" is consumer advocate Clark Howard's comprehensive guide to saving money, covering cell phones to student loans, coupon websites to mortgages, investing to electric bills and more. Howard, Atlanta-based host of a talk radio and TV show and founder of the website clarkhoward.com, has lots of consumer advice to share, His advice includes how to locate missing and unclaimed money in your name; lower your student loan payment; find legitimate work-at-home opportunities; get unlimited texting and e-mailing for less than $10 per month; know what personal info not to post to social media sites, and how to determine the best mortgage rate. Howard wrote this book with Mark Meltzer, an executive editor at Atlanta Business Chronicle, and Theo Thimou is director of content for clarkhoward.com.